Widespread use of thermic fluids in a plethora of industries such as plastics, concentrated solar power, food and beverages, oil and gas, pharmaceuticals, HVAC, and chemicals, is mainly driving growth in the associated market. Moreover, these fluids present numerous advantages over other alternative, thus possessing high demand. A rapidly expanding oil and natural gas industry too is making the global thermic fluids markets grow at a phenomenal pace. This is mainly due to a high need of these fluids in the context of oil and natural gas extraction in the form of mediums that help regulate temperature. Statistically speaking, the global thermic fluids market is prophesized to register revenue valued at US$4.17 bn by 2024, which is decent rise from initial revenue worth US$2.1 bn clocked in 2014. This growth is projected to occur at an impressive CAGR of 7.1% during the forecast period from 2016 – 2024. 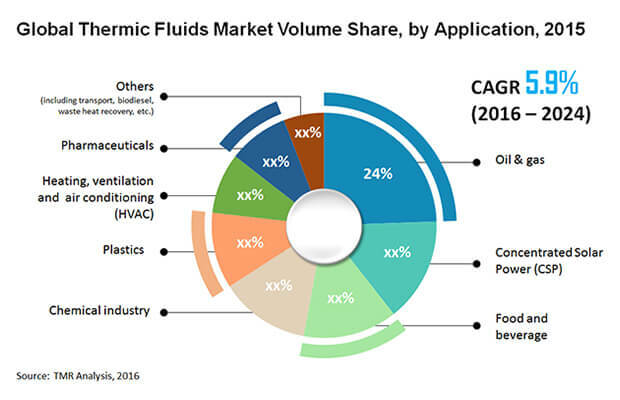 The global thermic fluids market is segregated into innumerable segments on the basis of three key criteria: product type, end-user, and regional spread. Under product type, silicone and aromatic based thermic fluids, mineral oil based thermic fluids, glycol (ethylene and propylene) based thermic fluids, and others, are key segments. Whereas with respect to end users, the global thermic fluids market consists of segments such as oil & gas, chemical, concentrated solar power, food & beverages, plastics, pharmaceuticals, heating, ventilation, and air conditioning, and others. Under product type, mineral oil based thermic fluids are expected to showcase extensive growth in the global thermic fluids market. This is mainly due to rising demand for these fluids thanks to their various advantages. Besides these, the glycol based thermic fluids also is expected to hold a leading position, thereby becoming an important segment in the market during the next few years. With respect to end users, the oil and natural gas industry segment is prophesized to trump all others thanks to the widespread need of the fluids to operate facilitate specific processes. Tremendous growth opportunities lie in this sector, with a recent valuation of US$479.4 mn possesses by the oil and natural gas industry. Apart from this sector, the chemicals industry too is showcasing handsome growth in the global thermic fluids market. To be more specific, this segment was valued at impressive revenue of US$254.4 mn in 2014, and is envisaged to expand at a healthy CAGR of 6.6% during the forecast period. In addition, the concentrated solar power segment is also depicting a promising growth in this market, by progressing at a splendid CAGR of 8.3% during the same forecast period. Geography-wise, the global thermic fluids market is spread across North America, South America, Asia Pacific, Europe, and the Middle East and Africa. Of these, a rising application of thermic fluids for thermal storage in concentrated solar power plants situated in Europe have made this region hold a leading position in the market. Moreover, a surge in awareness regarding use of thermic fluids in renewable energy harnessing technologies too has made Europe generate immense revenue from the global thermic fluids market. Kost USA, Inc., British Petroleum (BP), Dynalene Inc., Paratherm Corporation, Dow Chemicals, Eastman Chemical Company, Exxon Mobil Corporation, Multitherm LLC, Royal Dutch Shell, and BASF SE, are key players operating in the global thermic fluids market. This report analyzes and forecasts the thermic fluids market at the global and regional level. The market has been forecast based on volume (kilo tons) and revenue (US$ Mn) from 2016 to 2024. The study includes drivers and restraints of the global thermic fluids market. It also covers the impact of these drivers and restraints on demand for thermic fluids during the forecast period. The report also highlights opportunities in the thermic fluids market at the global and regional level. The report includes detailed value chain analysis, which provides a comprehensive view of the global thermic fluids market. Porter’s Five Forces Model for the thermic fluids market has also been included to help understand the competitive landscape. The study encompasses market attractiveness analysis, wherein end-use industries are benchmarked based on market size, growth rate, and general attractiveness. The study provides a critical view of the global thermic fluids market by segmenting it in terms of end-user industries. These segments have been analyzed based on present and future trends. Regional segmentation includes current and forecast demand for thermic fluids in North America, Europe, Asia Pacific, Latin America, and Middle East & Africa. The report also covers demand for thermic fluids in end-user segments in all the regions. The study includes profiles of major companies operating in the global thermic fluids market. Key players in the thermic fluids market include The Dow Chemical Company, Exxon Mobil, Eastman Chemical Company, British Petroleum, Shell, BASF SE, Dynalene Inc., Paratherm Corporation, Multitherm LLC, and Kost USA, Inc. Market players are profiled in terms of attributes such as company overview, financial overview, business strategies, and recent developments. The report provides the estimated market size of thermic fluids for 2015 and forecast for the next eight years. The global market size of thermic fluids is provided in terms of both volume and revenue. Market numbers are estimated based on end-uses of thermic fluids. Market size and forecast for each major end-use and product are provided in terms of global and regional markets. In order to compile the research report, we conducted in-depth interviews and discussions with a number of key industry participants and opinion leaders. Primary research represents the bulk of research efforts, supplemented by extensive secondary research. We reviewed the key players’ product literature, annual reports, press releases, and relevant documents for competitive analysis and market understanding. Secondary research includes a search of recent trade, technical writing, Internet sources, and statistical data from government websites, trade associations, and agencies. This has proven to be the most reliable, effective, and successful approach for obtaining precise market data, capturing industry participants’ insights, and recognizing business opportunities. Secondary research sources that are typically referred to include, but are not limited to are company websites, annual reports, financial reports, broker reports, investor presentations, SEC filings, internal and external proprietary databases, and relevant patent and regulatory databases such as ICIS, Hoover’s, oneSOURCE, Factiva, and Bloomberg, national government documents, statistical databases, trade journals, market reports, news articles, press releases, and webcasts specific to companies operating in the market. Primary research involves e-mail interactions, telephonic interviews, category, segment, and sub-segment across geographies. We conduct primary interviews on an ongoing basis with industry participants and commentators to validate data and analysis. Primary interviews provide firsthand information on market size, market trends, growth trends, competitive landscape, outlook, etc. These help validate and strengthen secondary research findings. These also help develop the analysis team’s expertise and market understanding.